This was possible through Rayalus courage, righteousness and revered patronage. A Poet named Ramalinga added feathers to the crown of reputation of Rayalu. Tenali Ramalinga or Tenali Rama, as he was famous by, belonged to a town called Tenali and that stuck as his Surname. Tenali is an important town in Coastal Andhra Pradeshs Guntur District. Tenali is also famous as Andhra Paris. Rayalus court known as Bhuvana Vijayam (Global Victor) was strongly upheld by eight poets called Ashta Diggajas (Elephants taking care of all the eight sides). Those eights combination was the strongest ever and was invincible for any scholar or Master of Arts and Sciences during those days. Tenali Ramalinga shined among the eight as a precious diamond in the diamond studded crown. Bhuvana Vijayam was host for discussions, arguments, and competitions of the learned and masters, almost all through the rule of the King of Kings Sri Krishna Deva Rayalu. 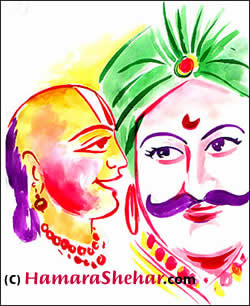 The historians and chroniclers found a synonymies between Akbar – Birbal and Rayalu – Ramalinga. However, despite the commonness among the two combinations, a small line distinct's Birbal and Ramalinga. While Birbal was famous for his delicate and involving humour, Ramalinga was stern and sarcastic in his wit to puncture the shields of proudness the others had. The records also state that Ramalinga was instrumental in protecting the King Rayalu and his prestige many a time, coming to his rescue in critical situations. A popular story among the commoners narrates how Ramalinga protected the Vijaya Nagar Empire from getting into the clutches of Delhi Sultans through his timely wit interlaced with a perfect strategy. The most popular stories about the lifestyle, combination, and co-ordination of Rayalu and Ramalinga spread the message of intellect, time tuning, and strategic stroking besides lively wit and humour. HamaraShehar.com is attempting to present some of the selectively collected stories for its citizens and browsers to hold their bellies before they read the laughing gas about the ‘activities’ of Ramalinga in and out of the royal court of Rayalu.